Nearly 600 Sea Turtles, Stunned By Cold Spell, Have Washed Up Off Cape Cod This Fall As of Monday morning, 584 sick and dead sea turtles had been recovered near Cape Cod, Mass., this year. One official says that total might reach 1,000 by Christmas. 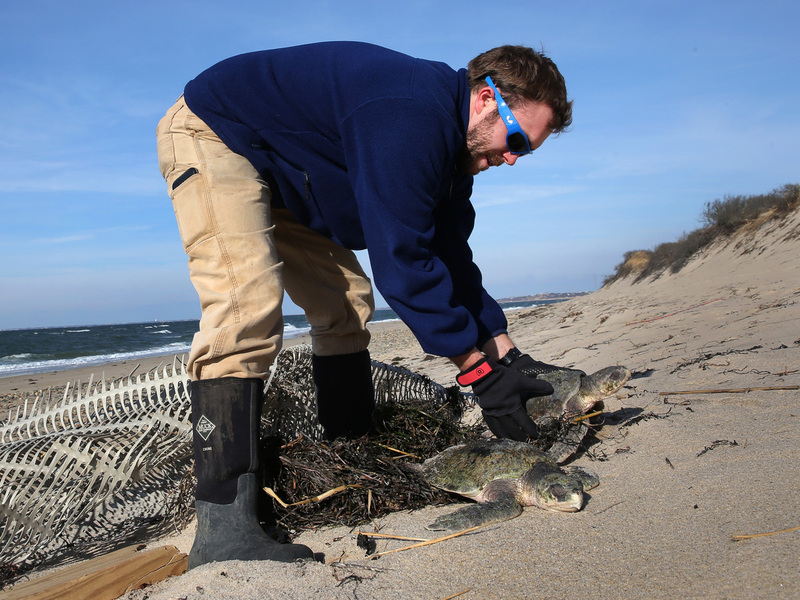 Michael Sprague with the Mass Audubon's turtle rescue program helps recover a stranded sea turtle in December 2014. In recent days, more than 200 turtles have washed up in Cape Cod because of a phenomenon known as "cold-stunning." The shores of Cape Cod, Mass., have seen a spike in the number of debilitated and dead sea turtles, with nearly 600 animals washing up so far this year, according to wildlife officials. "Cold-stunning," as rescuers call it, happens when the tropical reptiles are trapped in cold water and — because they're ectothermic, or reliant on external heat for their bodies to function — their systems begin to shut down. Unable to swim, they're pushed along by strong winds to the shore or to shallower waters, where they can literally freeze to death. "It was like they were flash-frozen, flippers in all weird positions like they were swimming," Robert Prescott, director of Massachusetts Audubon Society's Wellfleet Bay Wildlife Sanctuary, told the Cape Cod Times. As of Monday morning, the sanctuary had recovered 584 turtles, putting 2018 on track to be the second-largest cold-stun season since the sanctuary started its rescue program in the early 1980s, according to Jenette Kerr, communications coordinator for the sanctuary. Of that total, 340 turtles were found alive and 244 were dead — about a 60-40 ratio. Kerr told NPR that this early in the season, generally "about 80 percent or more of the turtles we rescue are alive." Kerr said the vast majority have been Kemp's ridleys, the most endangered sea turtle species in the world. There were also nine loggerheads, including one weighing nearly 300 pounds. Some of this week's survivors have been transported to the New England Aquarium's Animal Care Facility for rehabilitation. Scientists say that the naturally migratory turtles are heading farther north as climate change warms the planet's oceans. Some are now summering in the Cape Cod Bay, where they become trapped "by the Cape's hook-shaped geography," according to the sanctuary. Blocked from migrating down to warmer waters, the turtles are left vulnerable to volatile weather, like Thanksgiving week's cold snap and gale-force winds. "Sea turtles are moving further north along our coast ... as waters are warming and they are expanding their ranges," biologist Wallace J. Nichols told NBC News. "When we get these quick swings from warm to cooler, the turtles that haven't made it south definitely get into trouble." "Stranding season" typically lasts from about Thanksgiving to Christmas. This year's numbers have already passed what's typical for a year, Prescott said — and the total might climb to 1,000 sea turtles before the end of December. In the last four decades, cold-stunned sea turtles have been on the rise, peaking with 1,250 animals in 2014, according to the sanctuary. "The reasons for the phenomenon aren't clear, but much warmer waters in the Gulf of Maine and increased nesting productivity for some sea turtle species may be two factors," the sanctuary said in its statement.